The portable dockingstation RoadTop® RT 420-PCC supports 4 ISA standard slots, two of them with full lenght and full height and two with half lenght and full height. 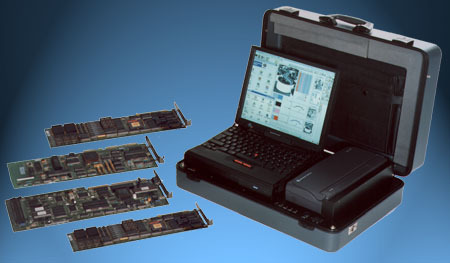 As with all RoadTop® dockingstations the ISA bus is driven by the PCMCIA-ISA Xtender-Bridge allowing operation with every todays notebook. The RoadTop® RT 420-PCC dockingstation is highly expandable. The standard version already includes a compact color ink jet printer for high quality color printouts on the spot. Moreover the system supports integration of 16 signal conditioning modules and measurement amplifiers according to the 5B standard. Together with the availability of different interface panels RT 420-PCC is an ideal platform for a powerful portable measurement and service system exactly meeting individual requirements. All RoadTop® dockingstations include a stable and easy adjustable snap in holder. That holder combines notebook computer and docking station to a compact, mobile unit. Installing and removing the notebook is a trifle. Power supply of the dockingstation as well as of the notebook computer is made by an integrated supply unit. No further external devices are required. The unit can operate from AC source and also from integrated accu with UPS functionality (uninterruptible power supply) and DC sources.